Moving leads through the sales funnel efficiently is the single most important objective for marketing and sales professionals. Trade shows and other face-to-face events are a huge part of any B2B marketing and sales plan. Marketing and sales teams work for months to make the most of trade shows - but what happens after the show is over? Ninety-eight percent of exhibitors collect sales leads at trade shows. Yet only 30 percent have any formal plan in place for how to follow up with those leads after the show. 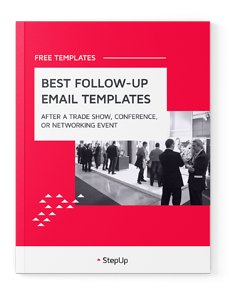 That's why we've compiled these effective follow-up email templates in this brand new guide, so you can start reeling in those leads. This is your guide to reaching more quality leads for your sales team.